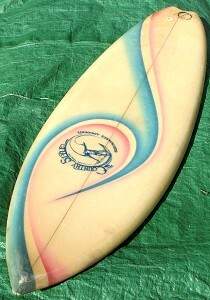 1978 Country Style 5 ft 5" * Shaped by Rodney Dahlberg. Foam blank, 1/16'' cedar stringer, spray decor, r/h legrope plug. NOTE* The board was originaly shaped as a rounded pintail but when the tail was repaired it was converted to its current swallow tail configeration and the length was shortened by 1 inch. All the relevant dimensions have been adjusted to the probable original measurements. Rails: down and harder in the tail. 7 1/2'' x 5 1/2'' base x 7 1/2'' span. 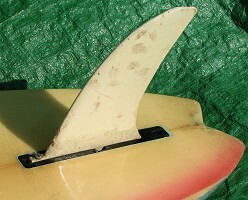 The fin tip has been damaged and slightly reshaped. Fin box .8'' @ 4 1/2''. Country Style Surfboards Angourie - blue script around surfrider graphic, offset right at the sweet spot (large). 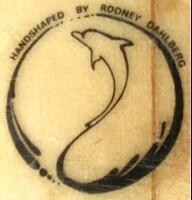 Handshaped by Rodney Dahlberg - black text with dolphin graphic in circle, offset left at the tail. 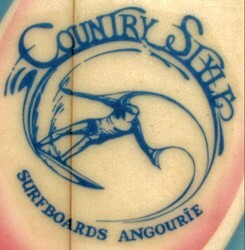 Country Style Surfboards Angourie - blue script around surfrider graphic, at sweet spot (small). Bottom: -GRUB- (above) and 5'5'' x 18 1/4'' (below) - pencil along the stringer below finbox. Deck: Clear with blue and pink spray wave/swirl decor from nose to tail. Bottom: Clear with blue and pink spray wave/swirl decor from nose to tail (mirrors the deck decor). Dimensions and photographs May 2008. Item submitted by John Embery, Shoalhaven Heads, NSW. The tail has been reshaped, as previously noted and the dimensions adjusted. A stock rounded pintail of the late 1970's, although in this case the very short length may indicate a small or juvenile rider. In the late 1970s, the design was most identified with South African professional surfer, Shaun Thomson, who was seen as representing the Single Fin Coalition against the evil Axis of the Twin Fin and it's leader, Mark Richards.